There are a myriad of Fad Diets out there; we’ve all seen them: the South Beach, Atkins, Probiotic, etc. Then there are lifestyle diets like veganism and raw food. Years ago, I switched to a vegetarian diet for ecological reasons to lower my footprint. As I read and listened more about food, this grew into a strict organic food based diet, then to organic local, and now I’ve backed off a bit and am “virtually” vegetarian as I learned more of the importance of animals to the function of a farm ecosystem . Food issues are of paramount importance to me – as a parent and a global citizen– driving much of the work for this blog, in my gardens, and my outreach. Whether you are trying to lose weight, make a statement or live your ethics, what we put into our mouths to sustain us has a huge impact not the least of which is on our health, but our food choices also greatly impacts our economy, our scenery, the climate, and our planet. Food matters… alot. 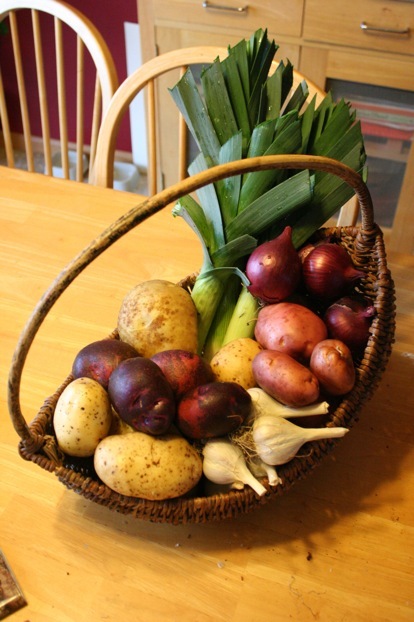 Over the course of the next few months I will expand on the topic of food grown in Living Soils as part of a Fall/Winter series of articles / essays concerning this topic. It is far bigger than even a 2000 word post, and I am looking forward to the 1000+ pages of books I have inbound to help me expand my knowledge on the topic. Plus its been awhile since I have written a larger article and I am rather looking forward to it. In the mean time here are some High Points, mostly opinions, though later posts will be better referenced. The data on the ills of our current, conventional farming system are legion, and well documented. Conventional farming practices promote erosion, are poisoning our groundwater, most of our food is trucked in from at least 1500 miles away, the farmers can’t earn living wages, and small town America is all but extinct outside of bedroom communities. The case for a different kind of Green Revolution is strong. Conventional Farming is crude, reductionist and is founded on failed assumptions. It is time to recommit to growing our food in Living Soils. As part of the back to Earth movement in the 60’s a growing number of farmers began to grow “organically” – the way that our grandparents had done prior to WWII. 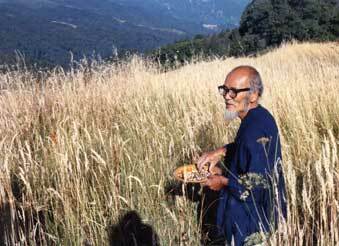 The inspiration for this blog, Masanoubu Fukuoka, was part of this movement to create a more sane, sustainable and productive agriculture that worked in partnership with Nature. One of the firm tenants that has developed in Organic Farming is the need to foster a living soil. Feed the soil, so that it may feed your plants and they, in turn, will feed you. In a single gram of living soil there may be as many as 100 million to 3 billion bacteria, but in denuded soils destroyed by chemical dependant industrial farming there can be as few as 100. The incredible interconnected biodiversity of our soil’s food webs is only beginning to be “discovered” by science. But we do know some things. First off, organic food is better for you. I know we’ve all gotten used to the see saw reports on this topic, but the majority of reports done in unbiased, or at least less biased, manner are showing what our “Common Sense” test has know all along. Food grown in living soils are more nutritious for you. From the USDA’s own reports, the nutritional content of our [conventionally grown] food is 25% less than it was 50 years ago because the soil is dead and it takes far more than Nitrogen, Phosphorus, and Potassium to grow Real Food. At the least it takes 18 micro nutrients including zinc and copper to create a balanced soil for plants – and those nutrients need to be in proper proportions to each other to prevent imbalances. Balancing 3 points can be challenging, balancing 18, plus tilth, moisture, density, and air porosity is a herculean task far beyond the scope of our technology. It takes the help of those millions of bacteria, fungi, protozoa, earthworms and other soil organisms with the wisdom of millions of years of evolution behind them, to get it right for us. When the soil web is healthy and stable -living- it is an amazingly self regulating system that balances itself over time to best foster healthy plant growth. Nature is beautiful. Not only are the plants more nutritious, but the heirloom varieties that can be only be grown in a holistic, organic, and local system are far superior to the supermarket varieties. Anyone who has tasted one of my heirloom Carola potatoes after eating Idaho Russets from the Kwik Trip understands exactly what I mean. Several years ago, I invited my Mother over to sample our first strawberry harvest at our home. Upon putting the small, Sparkle berry into her mouth she almost swooned, exclaiming “I haven’t tasted this since I was a girl!”. Strawberries are supposed to all but melt in your mouth – they are not intended to have a rigid core – that was bred in to allow them to be transported by truck, rather than by basket from the garden to the kitchen table. Our forefathers and mothers saved the seeds of the varieties with the best taste, and I fervently believe that our sense of taste is evolutionarily designed to sense nutrition – our bodies know that organic food is better for us. But living soils matter far more than just helping to offset the massive Health Care crisis of our time (we are the first society to be overfed to the point of chronic obesity, while simultaneously being malnourished). Our conventional farming practices are a significant cause of Climate Change. In a lecture some friends of mine heard in Sweden comparing the carbon cutting benifits to be had from transportation, housing, and food sectors – the Food Sector won by a margin of over 400%. Granted Europe’s Transportation and Housing sectors have come a long way compared to ours, but a recent article claims that switching to local foods and cutting back on red meat (to sane levels v. American levels) could reduce your carbon emissions more than swapping out 20 primary light bulbs (who has 20 primary bulbs?!) and cutting back your driving by 10%. But back to the soil. 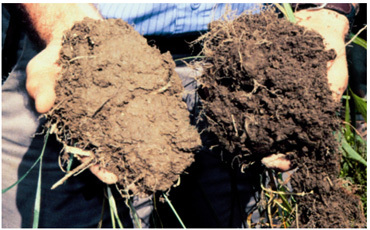 To feed the soil ecosystem you must supply one primary thing – organic matter. And the primary component of organic matter is carbon. The reality is that switching to a Soil Based agriculture system will have HUGE ramifications on our ability to sequester carbon as a planet. Much of the Ag land in America today is depeleted – down to 2-3% organic matter – less in many cases. Healthy, living soils have at least 5 – 8%. And here is the amazing stat: for each 1% you add back into the soil, you sequester as much carbon as exists in the entire atmosphere above that acre. And we need to sequester 3-5% back into every acre to rebuild the soil webs to rebuild our soils so we can rebuild our selves and our planet. That is an amazing amount of carbon – 21 tons per acre, per percent, in fact. In other words, a 200 acre farm that rebuilt its living soils and raised its organic matter 4% would sequester 16,800 tons of carbon. Damn! Living Soils are giving soils, providing far more bounty for less inputs because Nature is doing much of the work of the fertilizer supplier. When my grandparents farmed they raised a family of 10 on 175 acres – and that was a large prosperous dairy farm for its day. Now it would be a hobby farm in this era of industrial, corporate agriculture. With the need for literally over $1,000,000 in rolling equipment, not to mention the silos, dairy barns, etc to support the 2000 acre “farms” of today the bank interest alone is staggering – forcing most farmers to work additional jobs. Conventional farming has also killed our rural communities – 2000 acres 70 years ago would have supported 10-15 large families well, where now one farmer struggles with bankruptcy every other year because most of the income from the land goes to Cargill for supplies and to the bank in loan interest. Saner scale farms based on living soils, working in partnership with Nature, can rebuild our countryside, help to save our climate, and will provide a huge step towards stemming the tide of “lifestyle” disease and cancers as we put the nutrition back into our bodies. We need Living Soils for a Livable Planet. Potato Tower Results – An End to the Hype? Spud set 18" above seed height (bottom level) - proof of the tower theory? I even found a few more small potatoes above these. 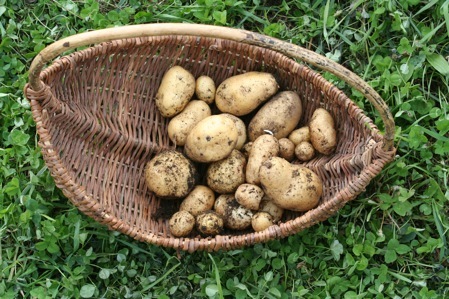 These potatoes were 18″ above seed potato depth – far higher in the soil than one would ever expect from conventionally grown potatoes whose potatoes are clustered within 6″ of the seed. In fact the potatoes in the harvest basket above ALL came from this plant as it was the only one to survive the steep learning curve as I had to climb as I experimented with this new growing technique. Given that a Carola potato seed is about 3 oz. the 48 oz harvested equates to a respectable 16:1 yield. 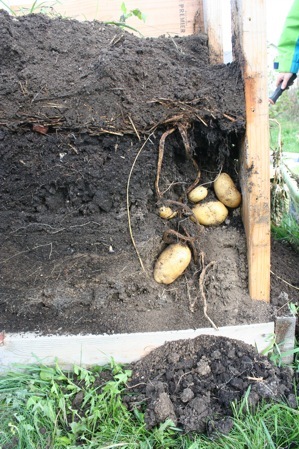 Of note though is that spud size was small with only 3 of the potatoes being typical Carola size which is completely opposite what one would expect from the lavish attention these towers received: watering, weeding, compost growing medium, fish emulsion and compost tea foliar sprays – I babied this plant! My strong suspicion, voiced as the towers grew, is that all the aggressive hilling perpetually knocks back the leaf growth and the plants never develop a lush canopy of sugar producing leaves to build the starch needed for a good harvest. Perhaps this is an issue that can be worked around with better technique, but its a strong concern. 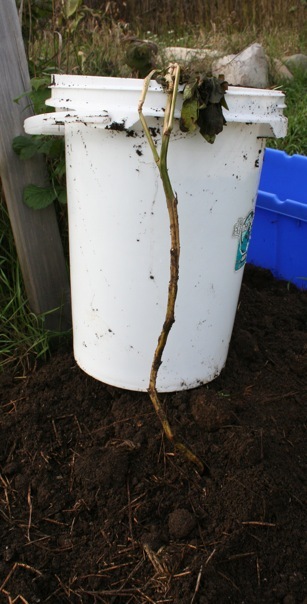 The bucket is placed solely to provide enough contrast to see the root-free “stem”. This is completely the opposite of what the Carola’s did – that plant had roots filling the entire tower and spuds at levels from 2″ above seed depth to 18″ above. Given that there are 300+ potato cultivars worldwide there is certainly room to further the research on this technique should people wish to continue the task. Want to grow your own experimental tower next year? Ensure VERY good drainage – I lost 80% of the plants due to waterlogging. Spacing the rungs 3/8″ to allow for swelling is a good start, placing the tower on a light soil (or a mat of 4-6″ of straw) is also a must. Pop a rung off near the bottom to check moisture before watering – these towers hold water VERY well. Tower height need not be more than 24″, though this may depend on cultivar choice – fingerlings get TALL. Add straw in a mix, not as a layer. My layers of straw blocked moisture and were saturated. Straw is still valuable – worm casings present in the vermicompost I added hatched and I found dozens of very happy red wigglers in the tower nibbling on the straw bits and adding plenty of fresh castings to the Carola plant. Do Potato Towers work? Maybe… that is the best I can say now. Technique is apparently paramount with the tower systems with alot of pitfalls for the gardener – it is far from idiot proof — and with all the variables Climate Change is throwing at us we need a less finicky system. Cultivar selection seems critical, and there is almost no research out there as to which kinds work. Carolas and Purple Viking seem to be a good choice – Kennebecs are not. The Hype – promising 100#’s from 4 sq ft is a joke. It still may be possible -and I hope it is– but it is not easy, it is not guaranteed, and it needs alot more research and realism before anyone goes filling the internet with wild claims. One of the main Pillars of Intent of this blog is to provide real, proven, and pragmatic solutions for growing healthy food in small spaces such as a suburban backyard. Do Potato Towers fit that bill? No. They are definitely in the experimental camp still. I intend to plant the tower again next year with what I have learned to see if I can eck out a full tower of harvest – even 20#’s from 4 sq ft would be a huge accomplishment. Kate over at Living the Frugal Life tried some of her own experiments this year and I was very impressed with her results. Using the ubiquitous 5 gallon bucket Kate was able to eck out between 8 and 14:1 yeilds which is as good or better than most organic field grown potatoes. Buckets allow you all the benefits of container gardening – they work on balconies, the corners of porches or allow you to grow in areas with tainted soils. Harvest is a breeze (dump the buckets!) and I love Kate’s idea of stacking the buckets in a pyramid. 10-12#’s from 4 sq ft should be possible with 6 buckets in a 2 teir pryamid. Simple, easy, effective. Try it! Have a bit more space? I tried another experiment this year on a sheet mulched old strawberry patch. My harvest blew me away: 30#’s from barely 1.5#’s of seeds in 8 plants of Purple Vikings – yes that 20:1!! Blight knocked the plants back early, so tuber size was low – 50#’s would have been possible had they gone to full weight! The bed was about 40 sq ft, so yeilds were not as high as the bucket per sq ft, but spacing could be tightened. 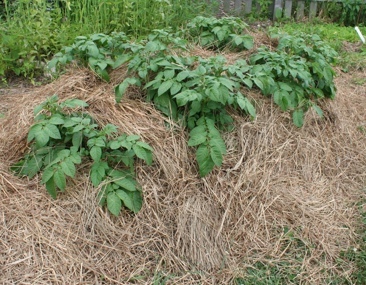 This method IS idiot proof – no additional fertilizer, the mulch is a natural Potato Bug repellent and all that straw keeps the moisture up really improving tuber size. 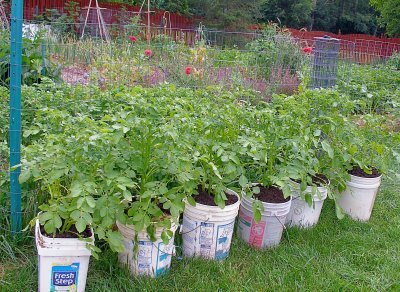 These 8 plants = 30#'s of Spuds! With winter around the bend it is a great time to try a sheet mulch bed for next year’s plantings. Thanks for everyone’s contributions, thoughts, and comments in this expirement this year!! Most of all, thanks for Being the Change! Lots of events coming up! Tomorrow and next Wednesday my wife and I are off to staff some Slow Food events hosted by one of our Chef customers . We will have the oppurtunity to educate the attendees on some of our favorite cultivars (we’ll have Kennebec, Purple Viking, Elba, Carola, and Desiree) as well as show how they can be combined with other easy to grow vegetables Garlic (Music), Onions (Red Baron) and Leeks (Blue Solaize) to create incredible hearty, healthy and sustainable food… with the dishes prepared by a gourmet chef! Then, in less than a month, I will be participating in the Madison Bioneer Conference (From Here to There) as a panel speaker on Saturday afternoon 11/14 if anyone is in the area. The event is promoting Real World solutions to food, energy, transportation, and community building to help us bridge to a Better Tomorrow. A very strong focus will be on success stories already up and running in the area. I am incredibly flattered that our little Suburban Experiment and small Market Garden were chosen to be part of such a cast of Heros (Will Allen is a Keynote speaker). Very, very excited about this. There are certainly enough headlines and anecdotal evidence out there to feed our inner Doomsday Voice. It will be fantastic to be focused on evangelising on how far we’ve come in so little time (we personally started less than 4 years ago) and using that message to inspire hundreds more to pick up the torch and start their own One Straw Revolutions. Fukuoka lives on in our actions and we are forever in his debt. More importantly we each have our own piece to add to the unfolding story that is our society’s answer to the challenges of our age. So this week saw the culmination of some significant changes in the World of Rob. Effective yesterday I have seen a shift change at work. One of the primary reasons that I can do all the things that I chronicle on this blog is that I have had a 3 day weekend -every weekend for the past 4 years. I have worked 5am until 5pm Tues-Fri for that entire time. As I work in a 24hour, 7 day operation for my pay, there has always been the possibilty of a shift change – and each passing year has increased the likelihood. of that happening. Effective yesterday my new schedule will consist of 3 monster 13 hour days, Saturday thru Monday, with the next 4 days off. While this means that as long as the kids are in school we do not get a full day off with them, I also get 4 days to be a better partner at home and find more ways to grow food, make fuel, and build soils on small acreages. FOUR DAYS! And then the summers – 4 days off together as a family. It is still sinking in and the pros and cons have yet to settle in. Will the 9 months with no full weekends eat away at us, or will the Summers and free time during the week out weigh it. Either way it works out to 7-8 less hours in the office a week and that is a Good Thing. The kiddos are still young enough (6 and 7) that Dad taking them to school is still cool, and I just might finally buy a Mundo Bike to ride them there in style. To everything turn, turn, turn. Potato Tower Results - An End to the Hype?